On the evening of May 17th, the Patagonia store in downtown Toronto was packed with happy visitors. Only instead of checking out the latest sweaters and backpacks for sale, friends and colleagues gathered to enjoy a photo exhibit presented by EVC and CONTACT. People gather to enjoy the reception for the EVC and CONTACT exhibit, on display at the Patagonia store for the month of May. Environmental Visual Communication (EVC) is a story-telling program offered in partnership by Fleming College and the Royal Ontario Museum. The unique program aims to bridge the gap between the arts and science, to relate environmental issues to everyday life and to help connect their students with environmental initiatives from around the globe. This May, as part of the CONTACT photography festival taking place throughout Toronto, the EVC exhibit is showcasing the work of students, instructors, and alumni. Danielle Da Silva, founder and CEO of PWB, works as an instructor with EVC and is featured in the exhibit alongside PWB video editor Dave Coulson. Danielle Da Silva, founder and CEO of PWB and instructor with EVC, poses with her photo featuring Sumatran orangutangs. "This exhibit is about bringing together the worlds of art, storytelling and environmental communication, and how photography can be a powerful tool to engage people in often complex and foreign issues," said Coulson. Coulson, who curated the show with Vincent Luk, is not only a video editor at PWB, but also an environmental photographer and EVC alumnus. Dave Coulson, who curated the exhibit, is an EVC alumnus, photographer, and video editor with PWB. "It was really great to see so many people come out to our reception and view all the great work being done by alumni and instructors of this program. And I’m really proud to have this exhibit take place in store at Patagonia, a brand and company that really aligns with what our exhibit and EVC program is all about,” he added. 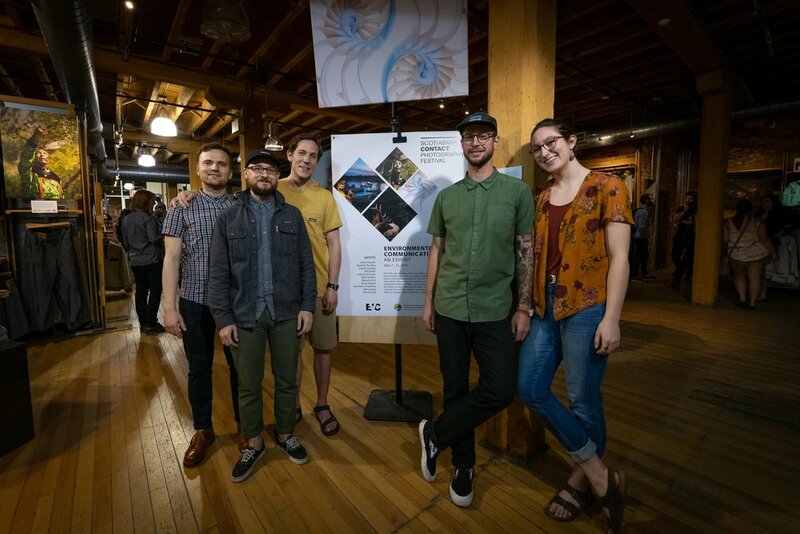 EVC and Patagonia staff, students, and community members celebrated the exhibit on May 17th. The EVC exhibit will be on display for the month of May at Patagonia in downtown Toronto. For more information on the EVC program, click here.